Today was such a great day!! Isabella and Jack had off of school for fall break, so I wanted to plan something they would enjoy and something I would like too. So for me -I love to go to the resale shop....my favorite one is in Portage, MI. 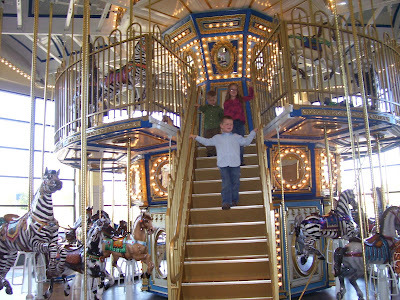 So we planned a trip and told them after the resale shop we would go for a ride on the new Double-Decker carousel at the mall. The anticipation of this trip was as much for me as for them. Now normally I do not take all the kids to the resale shop & the mall. It's just too much. Too long for them, to frustrating for me. But since I had been sick the first of the week with strep, I was ready for a field trip. I think psyching yourself up for something like this is the trick. Plan for everything to take 4 times as long. Plan for lots of trips to the bathroom, and plan for a little crying. But this was truly one of the best times I've had out by myself with all of them. None of us had seen a Double Decker before so this was a lot of fun. Mama and the baby got to ride for free. Oh, and the others- $2 a pop. A little on the expensive side, but well worth it. 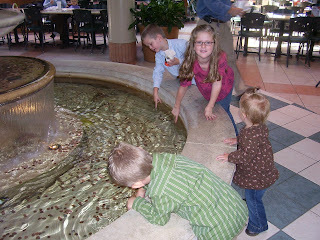 After the rides, we went for lunch in the food court and the kids played in the water fountain. William was asking Isabella for money to throw in, & before I knew it she was pulling pennies off the bottom of the fountain and giving them to the boys to throw in. What a girl. All in all what a great day. And only 2 people stopped me and asked, "are all these children yours?" Thankfully one of them added, "They are so well behaved" -Thankfully that woman didn't see one of those well behaved people sticking her entire arm in the water, to fish money out of the fountain. What a wonderful day! I think it is so funny that no matter where you go, you get those looks like, "Are those all yours?!" I think people still have 4 kids these days, they just leave them at home. =) Good for you for venturing out! 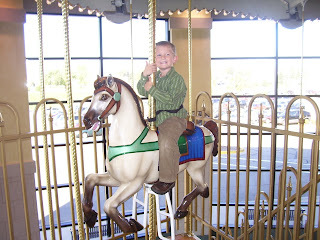 When I first saw the picture of the carousel, I thought you had been to Ft. Wayne...we have one just like that at our mall...and I was going to give you a hard time for not calling me. What a fun day...I've been wanting to make another trip to that resale shop again sometime. They have such nice things. Hurray, Isabella, you lost another tooth! Good work on the blog, Heather! This is a good way for Grandma to keep up on the Grandkids.